The campaign is being primarily conducted in the United States, the United Kingdom, Canada, Europe, Australia, New Zealand, Singapore and South Africa. In May 2011, Creation Ministries International initiated a Question evolution! campaign which encourages students and others to "question the evolutionary pseudoscience peddled to them", to wear anti-evolution clothing and to pass out Question evolution! tracts within their schools and community. The campaign features tracts, T-shirts, badges, mugs, etc. and students are being encouraged to participate in the campaign. Dr. Carl Wieland was a founder of Creation Ministries International. The Question evolution! campaign tract with the expanded questions includes short arguments and/or quotes in support of biblical creation, plus offers links to articles on CMI's website which provide supporting evidence. PPsimmons - QUESTION EVOLUTION! Worldwide Campaign! JOIN US! As the Question evolution! campaign has unfolded there have been a number of evolutionists who objected to the campaign and Creation Ministries International created some response web pages and videos. On October 1, 2011, the popular video creator Shockofgod created a video mentioning the inability of YouTube atheists Thunderf00t and Matt Dillahunty to answer Creation Ministries International's list of 15 Questions for evolutionists which are the focus of the Question evolution! campaign. VIDEO Previously, Shockofgod challenge Thuderf00t to answer the 15 questions. Fans of the Question evolution! campaign have repeatedly seen atheists/evolutionists challenged to debate the university biology student VivaYehshua via an oral debate which would be distributed widely. At the present time, atheists and evolutionists are afraid to accept and carry though with the debate offer. 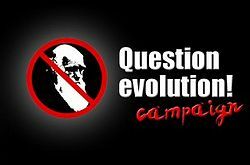 Associates for Biblical Research - Join the Question evolution campaign! Ken Ammi - Do you Question evolution? In 2011 the results of a study were published indicating that most United States high school biology teachers are reluctant to endorse the theory of evolution in class. At the time of the question evolution campaign, other creationists plus intelligent design proponents were engaged in legislative actions encouraging students to examine the evolutionary paradigm in a critical way. In 2011, eight anti-evolution bills were introduced into United States state legislatures encouraging students to employ critical thinking skills when examining the evolutionary paradigm. In 2009, there were seven states which required critical analysis skills to be employed when examining evolutionary material within schools. ↑ Is an atheist website backing down to creationists? This page was last modified on 9 April 2019, at 14:56. This page has been accessed 81,903 times.